With a deferred gift annuity, a donor benefits in two ways: first, by receiving an immediate charitable income tax deduction (thus, decreasing income taxes during high income years) and second, by building retirement income on a tax-sheltered basis. Because the investment has time to grow while income payments are deferred, the donor ultimately receives higher income payments and simultaneously creates an even greater charitable gift. Susan is single and 51 years old and actively saving for her retirement years. She is also very interested in doing something special to support the Mission. 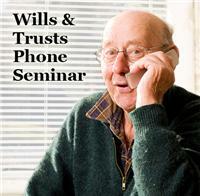 in exchange for a deferred payment gift annuity that will begin paying her a fixed lifetime annuity at age 62. 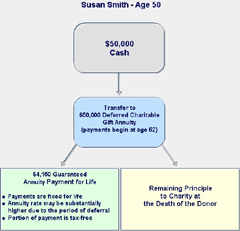 Under this arrangement, when Susan turns 62, she will receive annual annuity payments of $3,050, or 6.1% of her gift (of which $1,970 is tax-free). Susan also gets an immediate income tax deduction of $5,058, further increasing her total effective return for this investment. Susan will receive these payments as long as she lives, and afterwards, the Mission will receive the remaining balance.